R1234YF is the new generation of refrigerant (air conditioning gas) which is specifically designed for its environmental benefits. 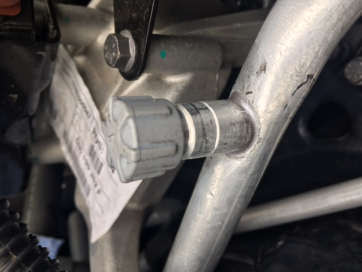 For the last 20 years the motor industry has relied on the less environmentally friendly R134a refrigerant (gas) to operate the air conditioning systems in most vehicles. Since 2013, EU laws required that all vehicle manufacturers designed their new car models with R1234YF in their air conditioning systems. From 2017 this requirement extended to all new cars. R1234YF operates in completely the same way as the old R134a refrigerant yet is significantly less harmful to the environment should it be discharged into the atmosphere (i.e. in the case of a leak from damage, natural leakage or during a repair). Being specialists in vehicle air conditioning, Air Autos, have all the equipment and expertise needed to regas or repair vehicles with R1234YF gas at a competitive price. A lot of older vehicles will still be designed to operate on R134a refrigerant which is completely legal and again we are able to service and repair these using the R134a gas. 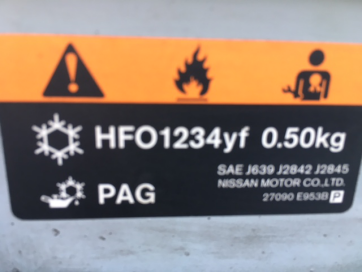 Most vehicles will have a sticker under the bonnet stating the type and volume of gas in the air conditioning system – example picture below. and we can confirm for you based on your vehicles details.